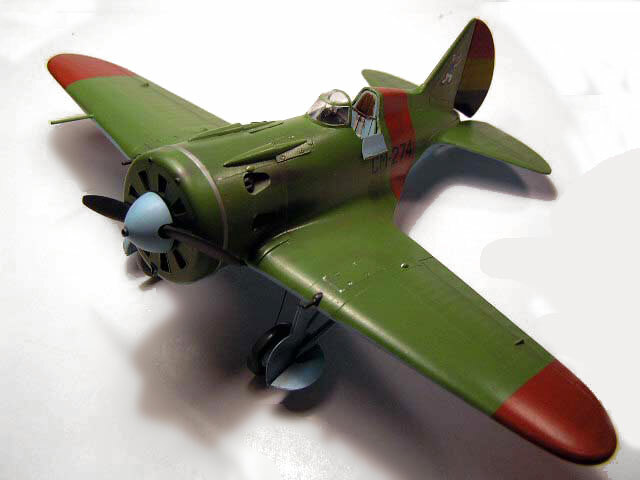 In his book on Soviet camouflage and colours, Erik Pilawskii delivers a veritable elegy to this little tubby fighter, once thought to be just a copy of the famous Gee-Bee American racers - backwards and obsolescence as a fighter - and now being reappraised by Western historians as one of the really meaningful machines of the 1930s. The Type 10 was developed from the Type 5 as a result of the experience in Spain, where the first batch was dispatched straight away. The fact that they were dubbed “Super-Moscas” speaks for itself, the type restoring parity with the early Jumo-powered 109s, which had proved slightly superior to the Type 5s. A new wing structure gave more rigidity and eliminated problems with wing warping (some Type 5s seem to have been fitted with the new wing also). A more powerful engine (M-25V, rated at 750 hp) and twice the armament (four 7.62 mm ShKas), with a proper reflector gunsight (PAK-1) completed the package. Pilawskii fails to mention the addition of flaps, which are acknowledged in the very detailed historical section in the kit’s instructions. Type 10s fought in Spain, in the Far East against the Japanese, and in the Winter War against Finland, still being the first fighter type in numerical terms during the early stages of Barbarossa. This is the brand new Eduard no. 8148, which would allow the modeler to build a Type 10 or a Type 17 from the contents of the box (though all the examples provided in the decal sheet are Type 10s). Previously, the only option in the scale was the Hobbycraft kit, in any of it different incarnations (even under the Academy brand –I seem to remember there was once a controversy about Academy actually “unlawfully obtaining” the molds from Hobbycraft) but this kit was plagued with errors and otherwise providing a “generic” kit from which it was very difficult to depict any Type properly. Various Airwaves resin conversions addressed some of the problems but were many times more expensive than the kit itself. At around than 20 bucks the Eduard kit is not only accurate enough but “self-contained” as well, including colour photo etched parts, good decals and precut masks (vinyl material, in my example), allowing a nice replica to be built out of the box. The crankcase for the undercarriage retraction system seems to be a bit too low in the sidewall. I added some linkages and cables, and some sundries such as map cases and the flare pistol. I also opened the side access door and the coaming lighting holes. The engine is perhaps the only disappointing single part in the kit. It is molded as half cylinders fixed to the firewall. In truth it can scarcely be seen through the vent doors in the front cowling, but, on close inspection, what is there is finely molded. I added the pushrods from stretched sprue and the ignition wires from cable, improving its look a good deal. As anticipated however, it disappeared behind the cowling, even with the vents wide open. What was left was finished very quickly. The cowling makes such a snug fit that can be left without glue. This allows you to paint everything and then detach it to glue the exhausts (I never glued it anyway, and the Steel ring masks any gap). I posed the rudder slightly deflected (yes, I checked the pedals). The windscreen fits perfectly; you could even add it after painting; although I did not. The undercarriage assembly is quite complex and the different doors lack a positive fit, be patient. I added hydraulic lines and the cables for the retraction gear. In my opinion, the colour calls for the cockpit in the Eduard instructions are questionable. Instead, I adhered to one of the “possible finishes” described in the book by Erik Pilawskii, and painted everything in the cockpit Undersurface Sky Blue. The bottom of the fuselage was, however, painted in WUP Wood Aerolak, as it was not technically part of the cockpit. The insides of the cowling were painted IMUP Metal Primer. Being a standard pre-war Polikarpov, I painted it in the standard scheme of AII Green and AII Blue. The demarcation in the front of the cowling was made following some pictures I found. The decal instructions calls the spinner to be painted Light Gray; I had no indication of such a Spanish practice and pictures showed a light shade undistinguishable from the undersurfaces, so I followed the standard Soviet practice and painted it in AII Blue. The Red Republican markings were painted using a darkened RLM 23 by Xtracrylix, as was the tricolor on the rudder, mixing the appropriate colours. Weathering was performed mainly by a heavy preshading, the transparent nature of WEMM’s paints propitiates this technique; and pictures I have seen show Republican machines in fairly good condition. All the specific colours came from the WEMM’s line; the rest are mostly Humbrol. The final look is much brighter than what we were used to see (I remember the colours of choice being usually any RLM 65 and IJN Dark Green, which render a much duller and darker machine) but nevertheless makes it instantly stand out in any kit line. Eduard’s decals are of aftermarket quality and the examples provided seem very well researched, (there are four of them, plus another in an experimental three-tone camouflage, devoid of any marking, of which I could find no reference in Pilawskii) but such is the masochistic nature of modelers that I chose to depict a Spanish Republican machine using some old Superscale sheet. Only the serials and the Popeye emblems were used, which of course performed flawlessly. I could not pinpoint a picture of this particular machine; however, many pictures show similar machines and I have seen a profile of this one (but we have learned not to trust these). This is a superb kit and I cannot do enough justice to it. It was also probably one of my quickest builds ever in my “adult phase of modeling” (three weeks, if it matters). The Spanish Civil War is one of the most interesting local wars of the ‘30s, and only now is becoming “well served” in model kit terms. Besides, the I-16 is undoubtedly one of the most significant warplanes of the period and it was a real shame (another one…) that no decent kit of it was available in quarter scale. - “Soviet Air Force Colours, 1941-1945”, Erik Pilawskii, Classic Colour Publications. - “The Spanish Civil War”, Osprey Publications.